The attention to detail paid by today's professionals to every aspect of their game means that even the balls they hit are, in many cases, custom made to suit the individual characteristics of their technique. A far cry, it has to be said, from the projectiles, if we may call them that, used by the golfers of centuries ago. The earliest golf balls would have been manufactured from wood and individually carved. By the very nature of the craft, it meant that there was no such thing as uniformity in terms of shape or weight between one ball and another. As the game took hold in Scotland during the middle of the 18th century, featheries were widely used. As the name suggests, these balls consisted of an outer casing of leather stuffed with feathers. The middle of the 19th century saw the first major advance in this direction with the use of gutta-percha, a gum sourced from south-east Asia, to produce balls that were truly round. Forty years later another advance in this embryonic technology came with the rubber cored Haskell ball. Players using the ball made from gutta-percha noted that whereas early in rounds the trajectory of a ball would drop off suddenly as it lost power, during the latter holes it would arc downwards to the ground. This behaviour coincided with the ball suffering a random and increasing pattern of dents from the impact with the face of the club. It was decided that such a pattern could have a direct and beneficial effect on performance and the Haskell was born. It was manufactured in three pieces, with elastic wrapped, a rubber core and an outer dimpled casing. Since then ball technology has moved on apace, and the range available to today's players is comprehensive. The cover or casing of the majority of modern balls consists of either Surlyn, usually a three-piece composition, or the two-piece Balata. The former material is much tougher and, therefore, long lasting. As such it is ideal for more inexperienced players who want to get maximum value for money from a ball offering a relatively long lifespan. Balata, on the other hand is softer but offers more spin. It may not last as long but it offers more experienced practitioners the ability to maximise its more sophisticated performance in the air. Compression - typically, 80, 90 or 100 - is another property to considered when buying a ball. As a guide, the 100 compresses the least of the three categories when struck, offering the golfer little in the way of the "feel" of the ball. Because of this, less experienced players are advised to opt for an 80. Today, tees can be manufactured from wood, plastic or rubber, in a variety of colours - some players even have personalised ones. The standard length is two and an eighth inches long although longer varieties are available. The early practitioners of the game often used sand to raise the ball above the level of ground, although by the turn of the 20th century, reusable tees made from paper, rubber or cork were in use. The first commercially available variety, known as the Reddy Tee, was invented by an American, William Lovell in 1921. Of course the humble tee has always quite literally played the supporting role to its much grander companion, the ball. 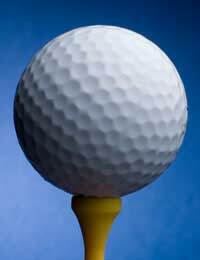 As if to emphasise the latter's self importance, there is a museum dedicated to the golf ball, which can be found at golfballmuseum.co.uk. It even features an ode "To a golf ball" by J H Hayes, published in the early years of the 20th century.